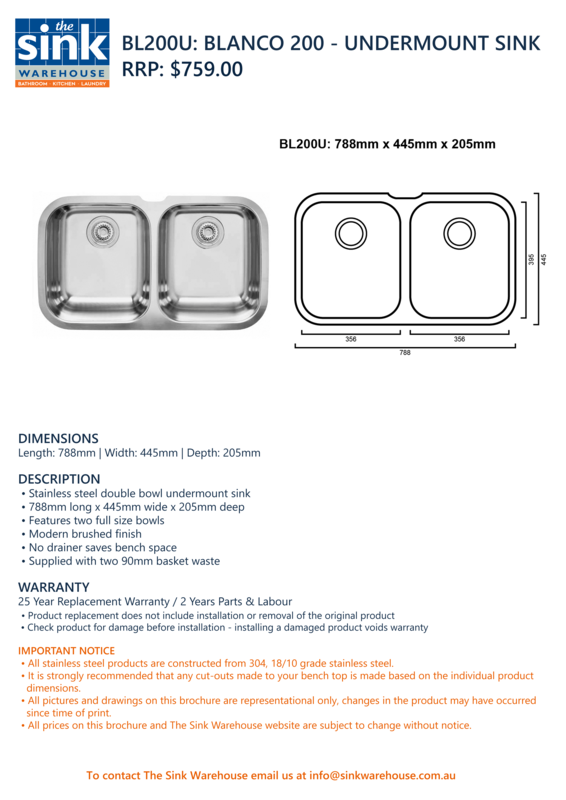 Blanco 200U - Undermount Sink | The Sink Warehouse | Shop Now! For residential purposes, most stainless steel comes in one of two “grades”, called 304 and 316. 304 stainless steel is the most widely used, making up about 50% of all stainless steel produced, as it has very good corrosion resistance and is easily shaped. 304 stainless steel is always composed of at least 50% iron and less than 0.8% carbon, however other components can vary. The most common two variants are referred to as 18/8 and 18/10. That is, 18% Chromium, 8% Nickel or 18% Chromium, 10% Nickel. The extra nickel content in 18/10 stainless steel provides a higher resistance to corrosion, while also giving a shinier appearance to the metal. Because of these benefits all of the stainless steel sinks available from The Sink Warehouse are 304 Stainless Steel, with an 18/10 mix. Stainless steel gains its corrosion resistance from a thin layer of chromium oxide that builds up on the surface of the metal, protecting it from any further oxidisation. It is important to keep this layer clear of dirt and other impurities to maximise the lifespan of your sink. Cleaning stainless steel regularly is key to a long lifespan and to preserve the high quality appearance. After use, the sink should be wiped with a soft cloth, rinsed and wiped dry. When the mains water is hard, it is particularly important that the steel is wiped dry, as this prevents the build up of a greyish film discolouration on the steel. Avoid using harsh cleaning tools such as hydrochloric acid, steel wool, or metal scrubs. These will scratch the sink and leave it looking dull and worn. A diluted mixture of vinegar and water (1:10) will remove any mineral deposits that may build up. If a steel polish is used to clean the sink, be sure to use a soft damp cloth (microfibre works well) and wipe with the grain of the steel instead of across the grain. Rinse the polish with water when finish and buff with a soft, static proof cloth. Try to avoid dropping hard materials in the sink. Inevitably stainless steel will scratch, however to minimise this as much as possible, be cautious when using materials such as glass, ceramic, stone or abrasives. Containing hydrochloride will attack stainless steel and cause pitting and staining. These contain strong acids which attacks stainless steel. The first sign of this is rainbow stain which turns dark grey and which cannot be removed. What if my Sink is Rusting? The stainless steel used at The Sink Warehouse contains an element known as Chromium which makes the sink rust resistant. The sink may appear to be rusting if iron particle from other materials have come in contact with your sink and bind to the sinks surface at any point from manufacturing to installation. When these iron particles react with water, they will begin to rust, which is what you will be seeing. Any metal cleaner such as Autosol (supplied by The Sink Warehouse) will take this off with no trouble.